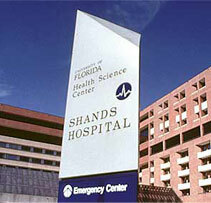 UF Health Shands is the primary teaching hospital for the UF College of Medicine. More than 500 physicians representing 110 medical specialties work with a team of healthcare professionals to provide quality care for patients. The faculty from the UF College of Medicine includes nationally and internationally recognized physicians whose expertise is supported by intensive research activities. UF Health Shands’ affiliation with the UF Health Science Center allows patients to benefit from the latest medical knowledge and technology.